As shown in the above video, the researchers send an image file loaded with malicious payload through the phone line, and as soon as the fax machine receives it, the image is decoded and uploaded into the fax-printer's memory. 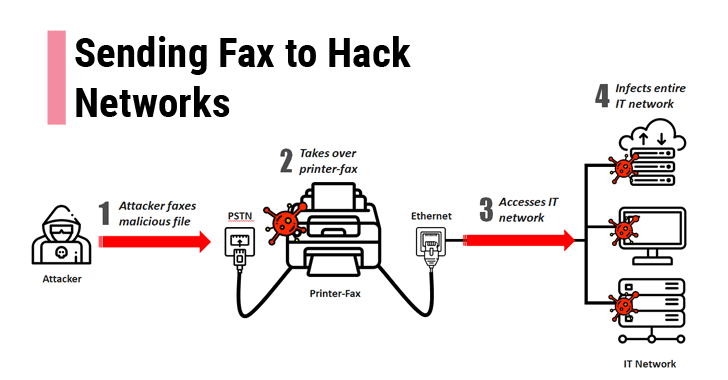 "Using nothing but a phone line, we were able to send a fax that could take full control over the printer, and later spread our payload inside the computer network accessible to the printer," the researcher said in a detailed blog post published today. "We believe that this security risk should be given special attention by the community, changing the way that modern network architectures treat network printers and fax machines." Check Point researchers responsibly disclosed their findings to Hewlett Packard, which quickly fixed the flaws in its all-in-one printers and deployed firmware patches in response. A patch is available on HP's support page.